The large woodshrike (Tephrodornis virgatus) belongs to the family of flycatcher-shrikes, philentomas and woodshrikes, Tephrodornithidae. The large woodshrike species are distributed in India, Nepal, Bhutan, Bangladesh, southern China and southeast Asia. The scientific name of these woodshrike species is in dispute and they are also referred to as T. gularis. These woodshrikes are polytypic species. The large woodshrike (Tephrodornis virgatus) is a thickset shrike-like bird, measuring 18 to 23 cm in length and weighing 25 to 45 grams. The large woodshrike species have drab gray-brown plumage. The male of the nominate subspecies has blue-black mask which is fairly broad beyond eye. The mask originates near nostrils and extends through eyes to the side of neck. The forehead of the large woodshrike nominate subspecies is whitish. The crown and the nape are grayish brown. The mantle and upperparts are grayish brown. The lower back and rump are whitish. The tail is grayish brown. The underparts and flanks are whitish. The brown mask in the female woodshrike is poorly defined. The bill is paler than the male and the eyes are darker. The juvenile has buff and brown spotted scaly crown and upperparts. The tertials and tail feathers have diffuse barring and buff fringes and dark subterminal crescents. The bill is heavy, hooked and blackish brown in color. The irises are brown. The feet are gray. The call of these large woodshrike species is a musical "kew..kew..kew" or a loud, ringing “pi-pi-pi-pi-pi-pi” sound. They also make harsh shrike-like calls. The large woodshrike species are distributed in north, east and northeast India, Nepal, Bhutan, Bangladesh, southern China, Myanmar, Thailand, Cambodia, Laos, Vietnam, Malaysia, Singapore, Brunei and Indonesia. 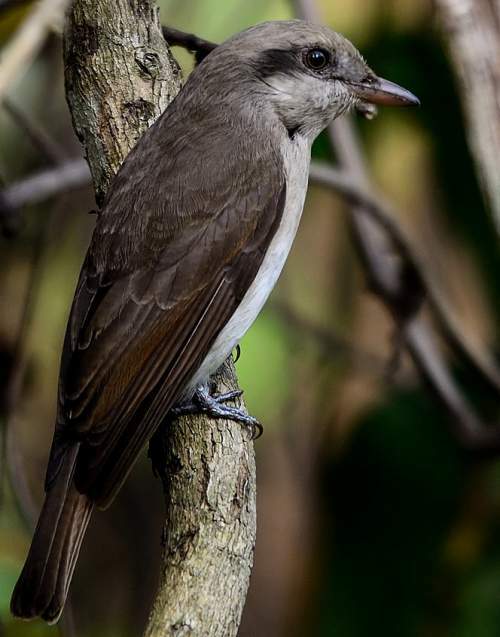 In India, these woodshrike species are distributed in the states of Uttarakhand, Uttarpradesh, Bihar, Odisha, Andhra Pradesh, Telangana, Chhattisgarh, Jharkhand, Sikkim, West Bengal, Assam, Meghalaya, Arunachal Pradesh, Nagaland, Manipur, Tripura and Mizoram. In China, these large woodshrike species are distributed in the provinces of Yunnan, Guizhou, Guangxi, Hainan, Guangdong, Hunan, Jiangxi, Fujian and Zhejiang. The large woodshrike nominate subspecies T. v. virgatus is distributed in Indonesia (Sumatra and Java). The subspecies T. v. frenatus is distributed in Borneo (Malaysia, Brunei and Indonesia). The woodshrike subspecies T. v. pelvicus is distributed in north, east and northeast India, Nepal, Bhutan, Bangladesh and north, northeast and southwest Myanmar. The subspecies T. v. fretensis is distributed in southeast Thailand. The large woodshrike subspecies T. v. jugans is distributed in east Myanmar, northwest Thailand and south China (southwest Yunnan). The subspecies T. v. hainanus is distributed in north Laos, north Vietnam and Hainan (China). 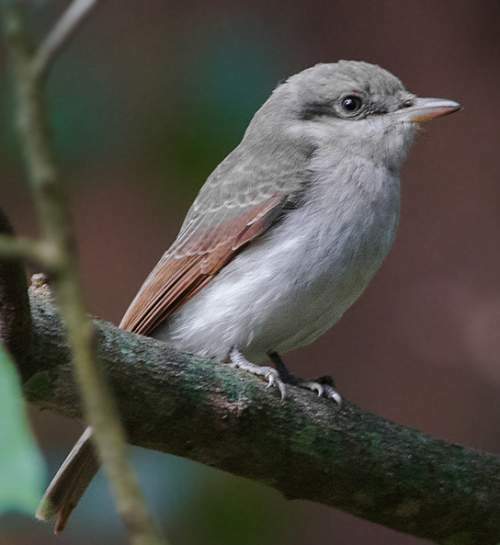 The large woodshrike subspecies T. v. latouchei is distributed in south and southeast China (Guizhou, Guangxi, Guangdong, Hunan, Jiangxi, Fujian and Zhejian).The subspecies T. v. verneyi is distributed in southwest Thailand and southeast Myanmar. The large woodshrike subspecies T. v. annectens is distributed in south Thailand and south myanmar. The subspecies T. v. mekongensis is distributed in southeast Thailand, Cambodia, south Laos and south Vietnam. These large woodshrike species have medium forest dependence. These species normally occur in altitudes from 0 to 1850 meters. The natural ecosystems of these species include broadleaved forests, moist evergreen forests, primary and secondary forests, tropical and subtropical moist lowland forests, tropical and subtropical moist montane forests and tropical and subtropical moist shrublands. The diet of the large woodshrike consists mainly of insects. 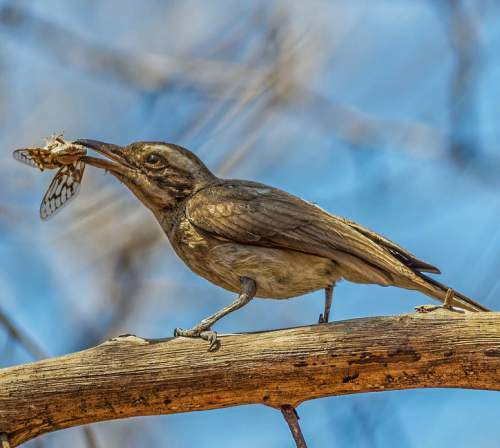 Grasshoppers, crickets, locust, beetles, dragonflies, moths, mantids, stick insects and spiders are their primary food. Occasionally they may feed on berries and plant matter. The large woodshrike species glean insects from foliage and from trunk and branches. They also hawk flying insects in the air from exposed perches. The breeding season of these large woodshrike species is from December to June in India with a peak from March to May. The laying season is from March in May in southeast Asia. The breeding season is from July in China. These woodshrikes are monogamous. The breeding pair build a cup-shaped nest on a fork of a tree. The nest is made of plant material held by cobwebs and plant fiber and is covered with bits of bark and lichen. The typical large woodshrike clutch contains 3 white eggs. Both the parents take turns to incubate the eggs. The female is seen feeding the young with berries and insects. The nestlings are entirely altricial, being naked and blind, requiring continuous parental care. The large woodshrike species are non-migratory resident birds. In Himalayas, altitudinal movements have been observed. The birds in higher altitudes move to lower levels during winter. Post breeding, the juvenile woodshrikes may disperse and establish in new locations within the range. They may make local movements for feeding and breeding within their range. The global population size of the large woodshrike (Tephrodornis virgatus) has not been quantified. The overall population trend of these species is reported to be stable. Throughout its range this woodshrike species is reported to be uncommon and locally common. The generation length is 3.9 years. Its distribution size is about 13,100,000 sq.km. Habitat degradation and fragmentation and trapping for the cagebird trade are the main threats that may endanger the survival of these woodshrike species. The large woodshrike (Tephrodornis virgatus) does not approach the thresholds for being Vulnerable, either under the range size criterion, or under the population trend criterion or under the population size criterion. The IUCN (International Union for Conservation of Nature) has categorized and evaluated the woodshrike species and has listed it as of "Least Concern". The CITES (Convention on International Trade in Endangered Species of Wild Fauna and Flora) status is ‘Not Evaluated’ for large woodshrike (Tephrodornis virgatus). The large woodshrike (Tephrodornis virgatus) is closely related to Malabar woodshrike (Tephrodornis sylvicola). The ten recognized subspecies of the large woodshrike (Tephrodornis virgatus) are: T. v. virgatus, T. v. frenatus, T. v. fretensis, T. v. pelvicus, T. v. mekongensis, T. v. jugans, T. v. annectens, T. v. latouchei, T. v. verneyi and T. v. hainanus. Current topic in Birds of India: Large woodshrike - Tephrodornis virgatus.